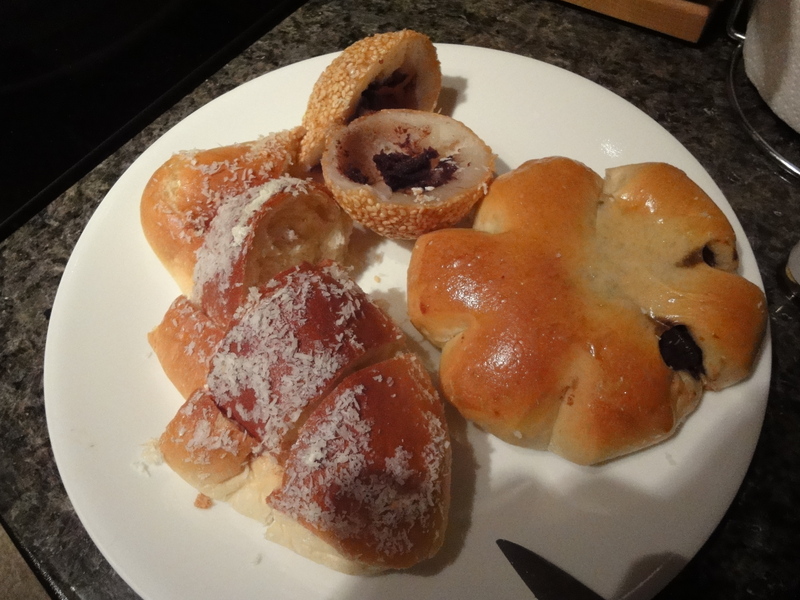 Ethnic food is as appealing to me as the next person (aka a lot), but ethnic desserts probably more. Yes, very, very occasionally I’ll fall for a piece of a cloying Red Velvet Cake, but mostly I’m interested in ethnic desserts as part of a metaphorical anthropological dig, as if identifying edible cultural artifacts as a expression of humankind’s adaptation to the particular conditions of geography and history. Yes, really. If I could do a fourth career in food culture, I would. I might. What’s great about living in Vancouver is that I can excavate practically on my doorstep. The small and inexpensive ethnic eateries of Vancouver are the best places to savor the traditional taste of home for many different Asian communities. Like the squash and sweet potato family? Well, then you’d be in luck, wouldn’t you? Personally, I’d take a squash dessert over chocolate mousse any day. This delectable yam treat is on the heavy side (it was the first time I’d noted the slick taste of shortening in a pastry in ages) but the filling had that chestnut-like aftertaste of a roast sweet potato. The Spanish colonial influence left its mark in the various sweet breads and flans that a second nearby Filipino bakery produces fresh daily. 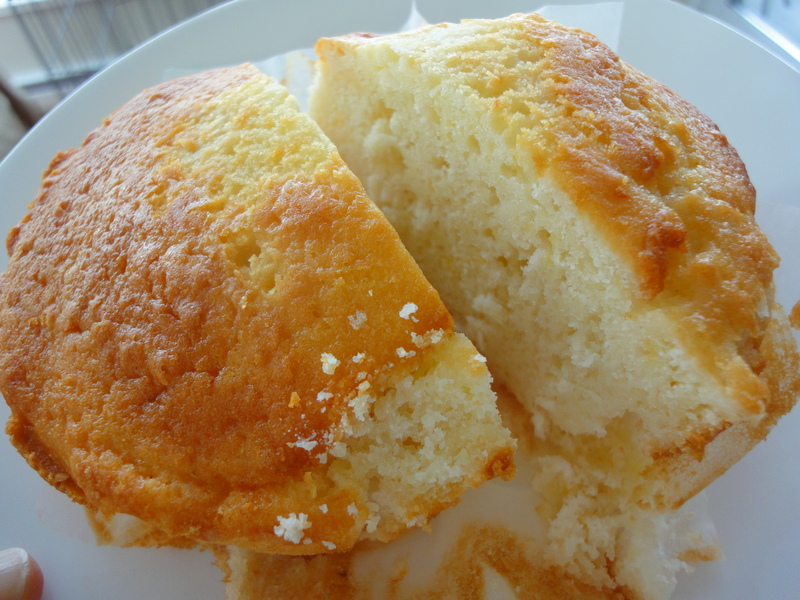 Try, just try, to hold yourself back from the open door ’round about 11am without being lured in by the fresh, warm aroma of pan de sal, flan and sweet buns prickling away at the salivary glands. Mostly these are variations on an egg, milk, butter, flour base with coconut flakes or cream thrown in. The proportions vary, but otherwise, it’s all based on the same idea. Sugary, rich, flecked or scented with just enough coconut to conjure up fantasies of palms swaying in the tropical breeze. 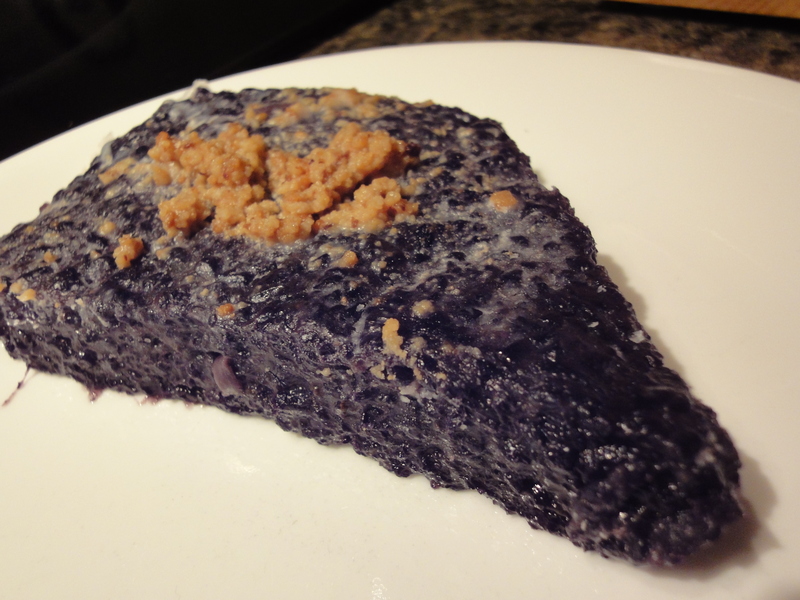 In Filipino and Malaysian eateries I’ve noticed variations on a black rice and coconut pudding. Exotic! This is definitely not the most appetizing-looking dish to the untrained eye. I’ll go so far to say it is not the most appetizing dish *period* to most non-Asians. My husband took one look at this and his lip involuntarily curled. But if I lived in Manila, this bland and mildly sweet dish is probably what I’d make to round out a meal of spicy pork stew. Look at how wonderfully dense it is with rice and coconut milk. There must be very little sugar in the recipe because it was about as sweet as plain oatmeal. Like most of the Filipino sweets I’ve tried, it weighed me down for a few hours. Next time I’ll make this a meal in and of itself. I’m quite captivated by the whole new world of Filipino sweets that I’ve only begun to discover, and to which I will be devoted for many days to come. And then there’s Indian. North Indian, to be exact. Apparently the choices of sweets originating from this part of Asia s are endless. 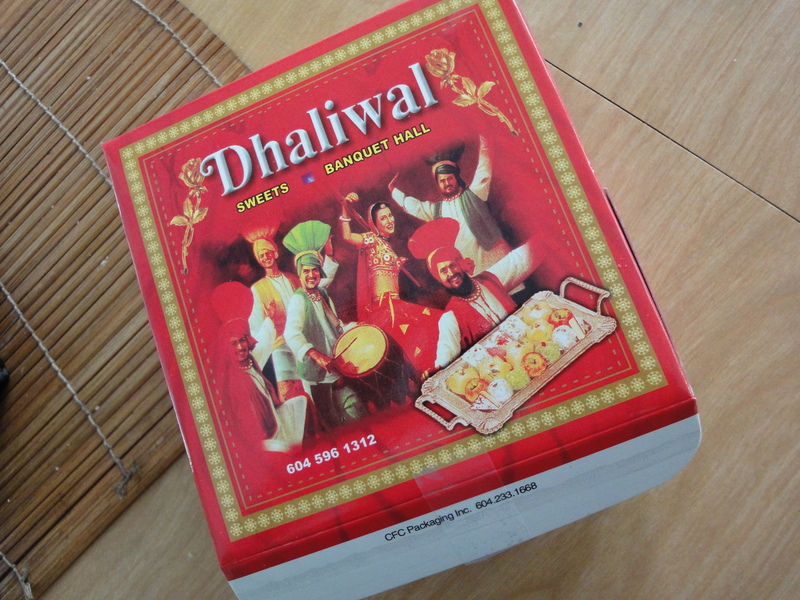 The sweet shops on Main and Fraser Streets display shelf after shelf of small squares, rectangles or balls of condensed milk, sugar, mung bean, lentil, vegetable, coconut mixtures that end up melting in your mouth. 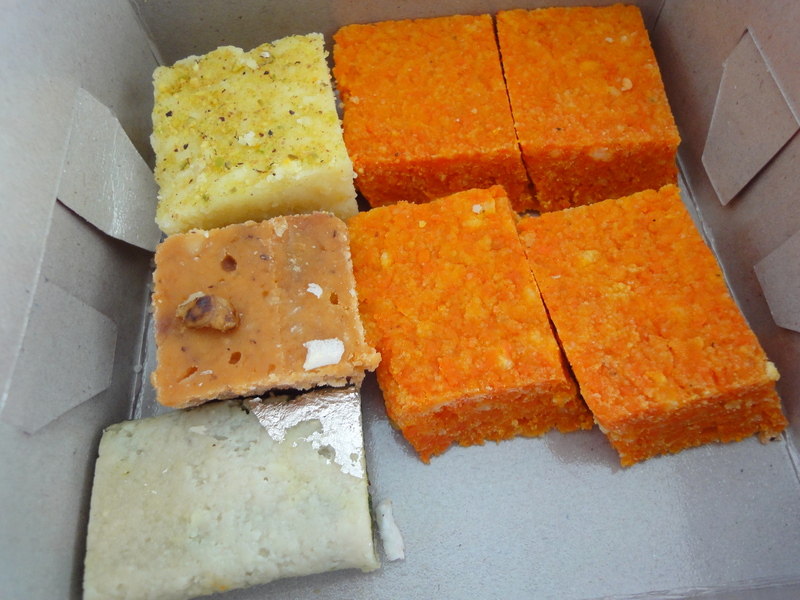 My favorite: the mini-brownie sized bites of carrot halwa. At about $.50 CDN each, they are the best deal in the city. I’m still sorting out the names of everything; for now I’ll go by taste alone. Most people are well-acquainted with Thai food. 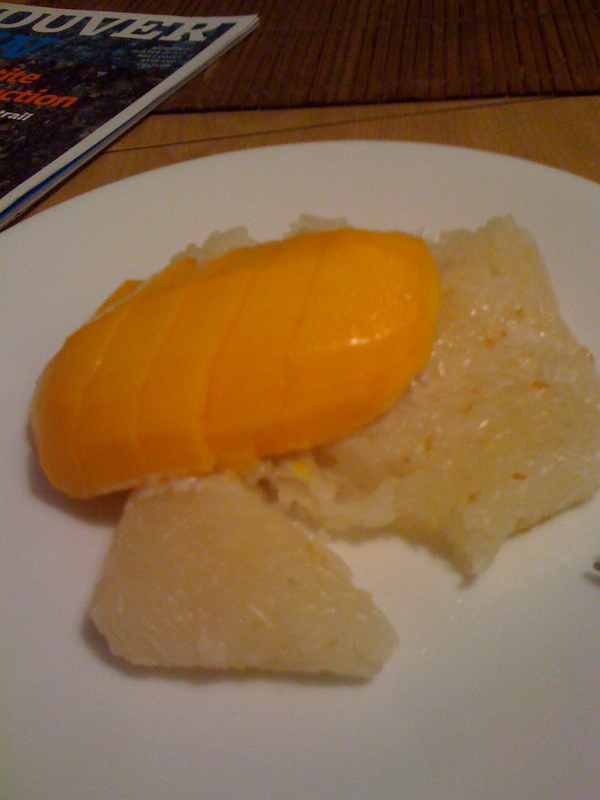 But no one — absolutely no one — I know actually likes the sticky rice and coconut dessert that is ubiquitous wherever Thai food is served. Except me. In fact, since I first tasted it in Bangkok many years ago, I’ve been on a perpetual search for the real thing, forcing me to sample far too many examples of this dish to count. Outside of Pok Pok in Portland, Oregon, I’ve yet to experience anything like that dark and damp night so many years ago, where through my jet-lagged stupor my overstimulated senses were struggling to reconcile the visual cacophany of brightly colored silks and cottons, the heady whiffs of tamarind and basil, the noisy foreign babble, and the ringing din of happily toasting and chatting fellow diners, before being rescued by the familiar yet exotic, sweet but salty, firm but tender, taste of calm delight as the first creamy rice kernels reached my lips. I’m searching still. But in the meantime, I get close enough to evoke those fond memories. 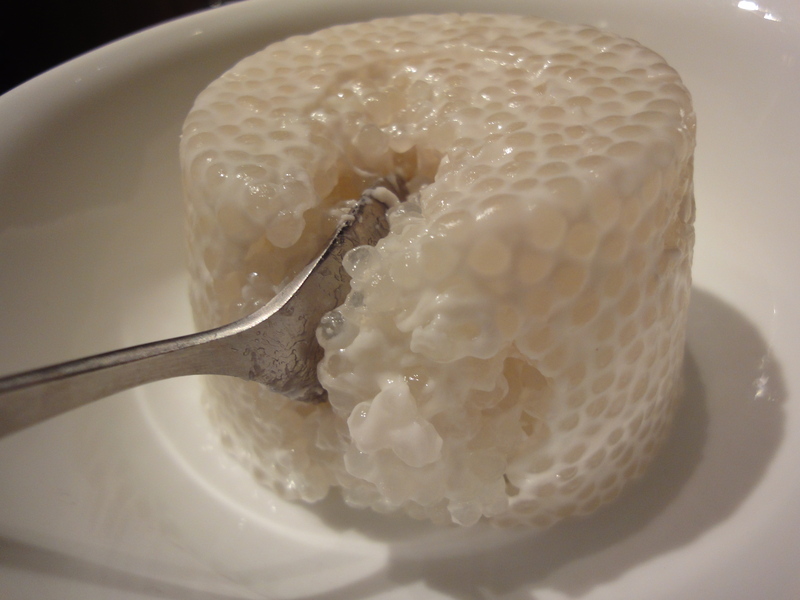 And sometimes, if only for convenience, a version made with tapioca will do. Lastly, one can’t bypass the Chinese bakeries. They are actually Cantonese, which due to the British colonial experience and some other cultural influences are nothing like Mandarin desserts. My favorite? 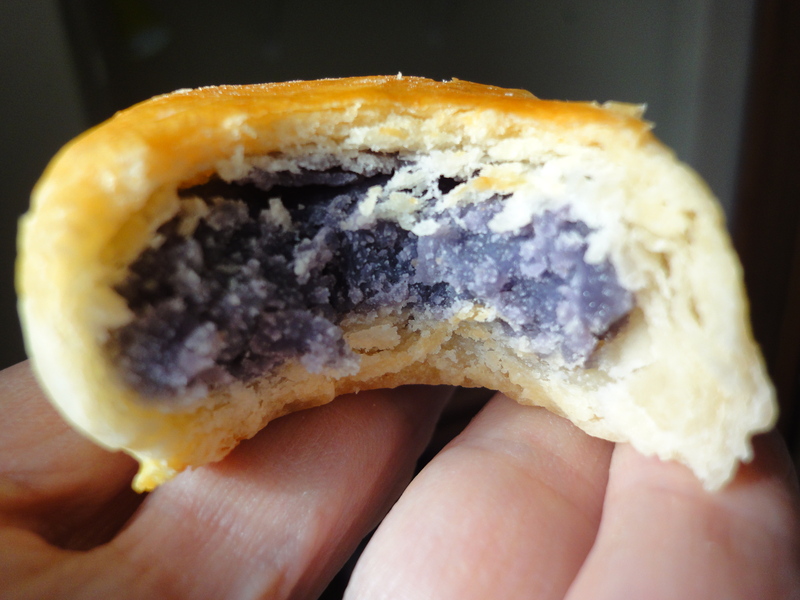 The bun is European — sugar, egg, butter — but the filling of pudding-like consistency is red or mung bean. It’s like a custard, only made of out legumes! Talk about doing the most with what nature has given you. I hadn’t realized that the bakery with all the standard wedding cakes in the window was actually Chinese until I stepped inside to inspect the premises while I waited to meet a friend for lunch at the Indian place on the corner. Before lunch was over I had decided to have Chinese dessert. That’s it for now. It’s Friday and the dig beckons. What’ll it be? The home made saffron and rose water ice cream by the Persian grocer? This entry was posted in food, Uncategorized and tagged Chinese desserts, ethnic dessert, ethnic food, Filipino desserts, Indian desserts, Main Street Vancouver, Persian dessert, Thai desserts. Bookmark the permalink. So yummy! I’ve been living in Vancouver for a while but had never heard of this amazing bakery!